When the official UN climate negotiations took place in December in Paris, France, thousands of people took to the streets of Paris to protest. Holding red flowers, umbrellas and banners, they created red lines along the boulevard Avenue de la Grande Armée and other streets to state their opposition to climate-damaging fossil fuels. The red line symbolically points from the victims to the perpetrators of the climate crisis – the fossil fuel industry. Indigenous Peoples were among those who took to the streets for an Indigenous Rights action on the closing day on Dec. 12th, hours before the final agreement was to be presented. Representatives from Indigenous nations of Circumpolar, Amazon, South Pacific and North America joined for an early morning sunrise ceremony at the foot of the historic Notre Dame Cathedral. The ceremony was disrupted by Paris Police who came to the square and begun to remove banners. We, Indigenous Peoples, are the redline. We have drawn that line with our bodies against the privatization of nature, to dirty fossil fuels and to climate change. We are the defenders of the world’s most biologically and culturally diverse regions. We will protect our sacred lands. Our knowledge has much of the solutions to climate change that humanity seeks. It’s only when they listen to our message that ecosystems of the world will be renewed,” said Tom Goldtooth (Dakota/Dine), Executive Director of the Indigenous Environmental Network, based in Bemidji, MN, U.S.A.
“Our planet is hotter. The seas are rising. Our communities are facing reality that we may have to move, we have winter wildfires happening in the Arctic. We are out of time. Any solutions that do not talk about cutting emissions at the source, or keeping fossil fuels in the ground, are false solutions. We don’t have time to talk about carbon markets, carbon trading, REDD+ projects. 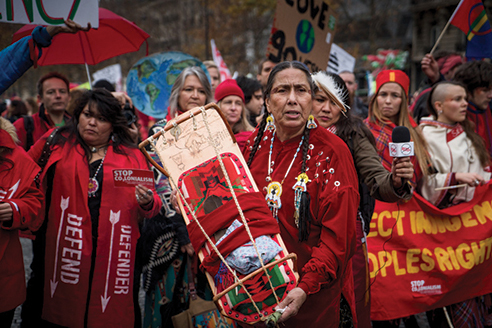 We must act now,” said Goldtooth. “The seas are rising, our communities have nowhere else to go,” said Sina Brown-Davis, a Maori activist. At noon, Indigenous peoples joined in solidarity with the global D12 REDLINE action at Arc de Triomphe. 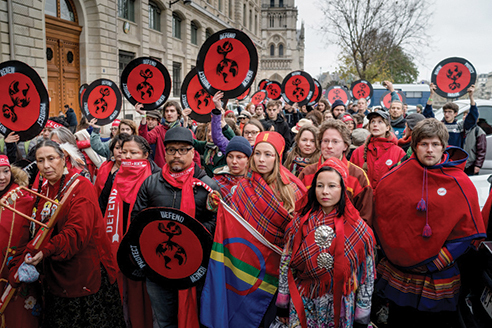 At the front of action, Indigenous Peoples held a conference condemning the failed leadership of nation states for their exclusion of Indigenous rights and human rights in the operational text of the Paris agreement. “Here at the COP21 they are proposing false solutions to the climate crisis, they are proposing a commodification of the sacred, they want to put a price on the air we breathe. They want to go into other countries, displace our Indigenous brothers and sisters, so that they in the US can continue killing our people. We are the frontlines, we are the red lines,” said Kandi Mossett (Mandan, Hidatsa, Arikara, North Dakota). Over 50 Red Lines solidarity events were organized worldwide in North America, Europe, South Africa and Nepal. Reprinted with permission of the Indigenous Environmental Network .